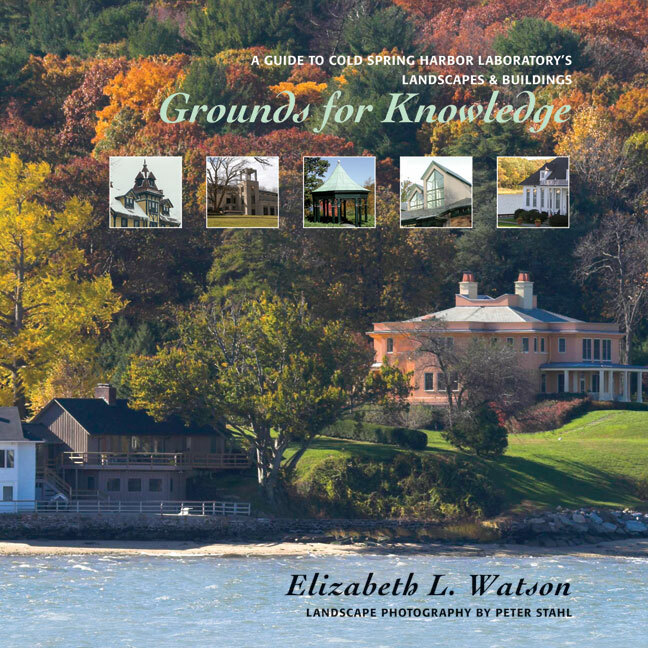 Grounds for Knowledge is an engaging and knowledgeable guide to CSH Laboratory's buildings both historic and new, and to the 150 species of trees that surround them. The superb color photography and detailed maps invite exploration of the newly designated Bungtown Botanical Garden. Buildings and landscapes of nearby Lab campuses in Woodbury, Lloyd Harbor, and Cold Spring Harbor are covered as well. About the author: Elizabeth Lewis Watson, a native of Providence, Rhode Island, graduated from Radcliffe College and has earned two master's degrees – in Historic Preservation, from the Columbia University School of Architecture and Planning (1983); and in Library and Information Science, from the Palmer School of Long Island University (1997). She also holds honorary doctorates from the College of Charleston and Illinois Wesleyan University, where she has lectured on the preservation of historic landscapes. Author of Houses for Science (a centennial history of Cold Spring Harbor Laboratory, 1991), she also drafted the nomination papers that led to placement of the Laboratory's main campus (along Bungtown Road) on the National Register of Historic Places, 1994. In addition, she authored A Limner's View (a sailor's view of world architecture, with "limner" Faith H. McCurdy, 1993) and contributed to The Mansions of Long Island, 1860-1940 (1997). Occupying various homes at "Bungtown" for nearly four decades, together with her husband James Dewey Watson and two now grown sons, Liz has always taken a delight in the grounds of the Laboratory – a pleasure heightened only recently by a course of study on the campus of the State University of New York at Farmingdale, in their program on Ornamental Horticulture. Long a trustee, plus a past president, of the Planting Fields Foundation of the Planting Fields Arboretum State Historic Park in nearby Oyster Bay, Long Island, she was instrumental in the Laboratory's joining the American Association of Botanic Gardens and Arboreta (now the American Public Gardens Association) as the Bungtown Botanical Garden in 2006. A devoted trustee of the Society for the Preservation of Long Island Antiquities (SPLIA), Liz Watson has also served on the boards of the Cold Spring Harbor Whaling Museum and the Heckscher Museum of Art and as a member of the Huntington Historic Preservation Commission. She was appointed in 2001 to the New York State Board for Historic Preservation and currently serves also on the boards of the New York Landmarks Preservation Foundation and the Archives of American Art. Besides having become a manic "leaf peeper" (and aspiring to "bird watcher") in her free time, Liz is an avid photographer, enthusiastic traveler, and happy hostess to those from near and far.